Court declines to stop Saraki’s CCT trial - BlogIT with OLIVIA!!! The Senate President, Dr. Bukola Saraki, on Friday, failed to persuade the Federal High Court sitting in Abuja to stop further hearing on the 13-count criminal charge pending against him before the Code of Conduct Tribunal, CCT. The high court, in a judgment that was delivered by Justice Abdul Kafarati, dismissed Saraki’s suit as grossly lacking in merit. It held that the suit which was filed after the Supreme Court gave the CCT the nod to try the applicant, constituted an abuse of court process. 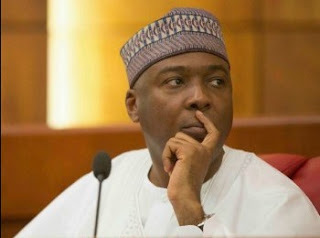 Stressing that none of the reliefs Saraki sought in his suit fell within the contemplation of section 4 of the 1999 constitution, as amended, Justice Kafarati, said he was convinced that the applicant was only bent on frustrating his trial before the CCT. “All the applicant is trying to do is to forestall the criminal process before the CCT”, the Judge held. Besides, the court said the CCT has the constitutional powers to handle cases bordering on alleged false declaration of assets and breach of code of conduct by public officers. Justice Kafarati observed that the tribunal had earlier ruled that it has the jurisdiction to try the defendant on the basis of the charge preferred against him by the Federal Government. He said that granting Saraki’s prayer for the charge to be quashed, would amount to setting both the high court and the CCT on a collision course. More so, the Judge said he could not interfere with constitutional powers of the defendants to carry out their responsibilities. “It is important to note that this case was filed after the applicant’s appeal against the tribunal was dismissed.